After a routine cleaning – removing essentially all the parts (PSU, CPU fan, GPU, HDD and DVD drive, cleaning each separately, well except for the HDD and DVD) – the system would not come back on. The monitor showed nothing. The boot beep was longer, about a full second or more. The boot process repeated itself over and over, each time displaying nothing and just beeping. I unplugged the system and moved the rightmost RAM stick over one slot. That did it! My primary question: the RAM is under warranty – should I take it back, or this a problem with the motherboard? I'd like to be able to use the dual channel capability. According to the motherboard manual, I should put the two sticks in the leftmost slots (of the same color) and not one in each of a different color. So, as of this moment (as I write this!) I don't know what memory state it's in. Secondary question: How do I check? Everything seems fine; should I be worrying? I really hope it's not the mobo. I use Kingston HyperX DDR2 RAM on a Gigabyte motherboard. Another detail I should probably mention: I ran memtest about a half year ago, overnight, (RAM was in the leftmost two slots) with no errors. The whole story goes like this: I've been having trouble for two years now figuring out the cause of my system lockup, which happens fairly often but irregularly. I've ruled out temperature and overheating, HDD error; I've installed new drivers for everything, etc. I really hope the RAM is the problem, because then I could just get a new pair and be done with the system freezing issue. When it comes to memtest, overnight is not always enough, and passing half a year ago does not mean they'd pass now. Overnight might be enough to prove the memories are faulty, but not enough to prove they work. Something like 1-3 days straight is needed to be reasonably certain about the memories working. Also, it is possible the motherboard is somehow faulty, and single-channel operation works but dual-channel does not. If the same memories in different slots work fine but in some not, I'd suspect the motherboard. Dual-channel operation obviously changes the stress to the motherboard and processor, so it can make problems come up that would eternally go unnoticed on single-channel operation. Knowing your processor, motherboard and memory models would not hurt in helping you, too. Its impossible to diagnose over the internet. But your test with moving the RAM to different slots is a good enough reason to replace them under warranty. Once you get the replacement RAM, and the machine is still not functioning properly, then you know its the motherboard. But at least you know your memory is good at that point. Not the answer you're looking for? Browse other questions tagged memory motherboard dual-channel or ask your own question. 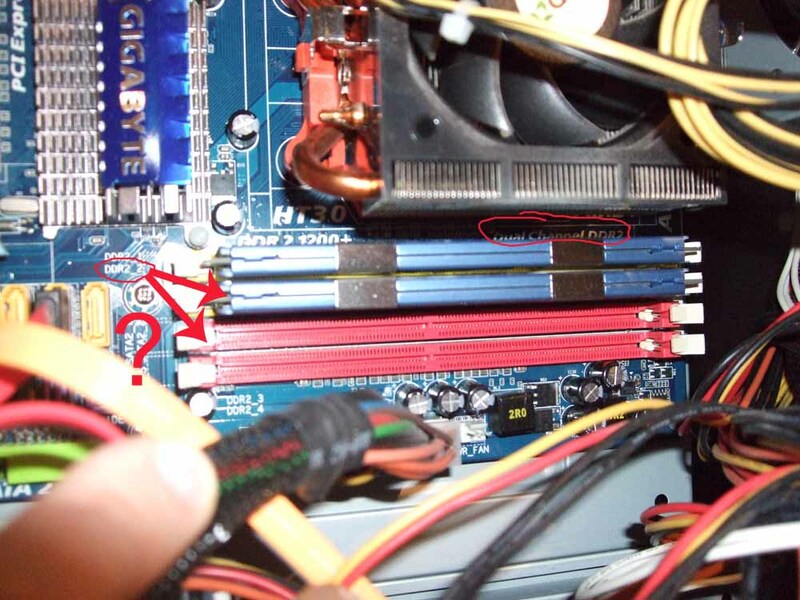 RAM is loose in slots: replace it or replace motherboard? Bad RAM or bad motherboard? Is my motherboard RAM slot defective? Laptop reporting wrong count of RAM slots? Both ram sticks or motherboard defective?